Please contact us if you want to be added to our site. I have found the biggest GMO ingredient being used at restaurants who are using some organic and locally sourced food is cooking oil (canola, soy or veggie). Restaurants who have already made the switch to not using GMO oil have switched to using pure olive oil, butter, coconut oil, rice bran oil and grapeseed oil. “All natural” does not mean all natural anymore. “All natural” meats and cage free eggs are almost always fed GMO grains. If you don’t know, ask the farm where you get your food from. If you are serving your customers “all natural” free range antibiotic free meat, cheese, eggs, then you are serving your customers GMOs. Click here to see a list of GMO ingredients that you may be using at your restaurant. NON GMO FOOD RESOURCES - Click here to see a list of of organic and non GMO farms to source ingredients from. If you are a restaurant in the process of switching out your potential GMO ingredients, please contact us so we can update our information. If you are a restaurant that does not use GMO suspect ingredients, please contact us so we can add you to our list. 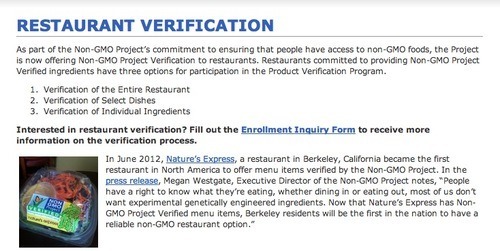 If you are interested in having your restaurant be NON GMO Certified, please go to the Non GMO project to learn how to enroll in the program.